I'm not much of a dreamer, and usually if I do have a dream I never realy remember it fully, just my thoughts and feelings during the dream. 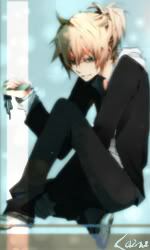 when the guy i like asked me out..
Hikari18 wrote: when the guy i like asked me out..
Bah! It was a nightmare, the worst kind! the people knew me, and i knew them. yet i'd never seen them before. they were very nice people. ...i think one of them died, though. The one dream that I do remember was when my step grandfather was a vampire. Then somehow, I was in a closet with my sister and cousins banging on the door saying, "you know you want to get bitten~ Join us" And even though I REALLY wanted to, the door wouldn't open. But the dog was in the closet with me and I was bitten. And then it was morning and I was late for school. So I started flying (o.o??) and then from the distance, somebody was calling my name. It was my mom. I was really late for school that day. A single dog was sitting in the middle of the street and a cat came along. The cat began licking its fur and was run over by a car and the dog just stood there. Then a man came along and looked at the dog. He noticed the dog was already dead...it had died of starvation. The man took the dog to a field and buried him. A few days later the man was found dead in the middle of that same road. hawleyaw wrote: A single dog was sitting in the middle of the street and a cat came along. The cat began licking its fur and was run over by a car and the dog just stood there. Then a man came along and looked at the dog. He noticed the dog was already dead...it had died of starvation. The man took the dog to a field and buried him. A few days later the man was found dead in the middle of that same road. I don't know what the purpose was...maybe stay away from dead dogs? I'm gonna get run over by a car? I actually have cat ears in real life. so you're NOT a real neko?